That's right, they are living and breathing! The link below will take you to a video of an experiment conducted by Wenyuan Shi at UCLA in which a totally clean, hydroxyl appetite surface is being pulsed with human saliva. The video begins at hour 16 and the next 8 hours of biofilm formation is time-lapsed into 2 minutes. What you see first are the initial colonisers, which tend to be streptococcal species of bacteria, that have the ability to produce extracellular polysaccharides, which means they can produce a sticky compound that allows them to adhere to the enamel. You will see these initial colonies grow in size and some new colonies establish themselves. We know that as any species of bacteria establishes itself in the biofilm it may undergo as many as 84 genetic mutations and that biofilm bacteria are 1,000 times harder to affect than vagile (free-floating) bacteria. It is important to keep this in mind when we look at effective ways of treating biofilm diseases. 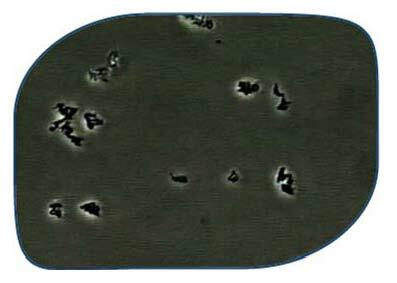 As formation continues, you will begin to see some other species of bacteria, some rods and filamentous bacteria beginning to colonise. Bacteria within a biofilm live very synergistically, in that one species will metabolize an available nutrient, create a waste product from it, and another species will use that waste product as its nutrient. You are seeing nutrient and waste channels forming that aid in communication. See a video of a dental biofilm forming below. . . yuck!